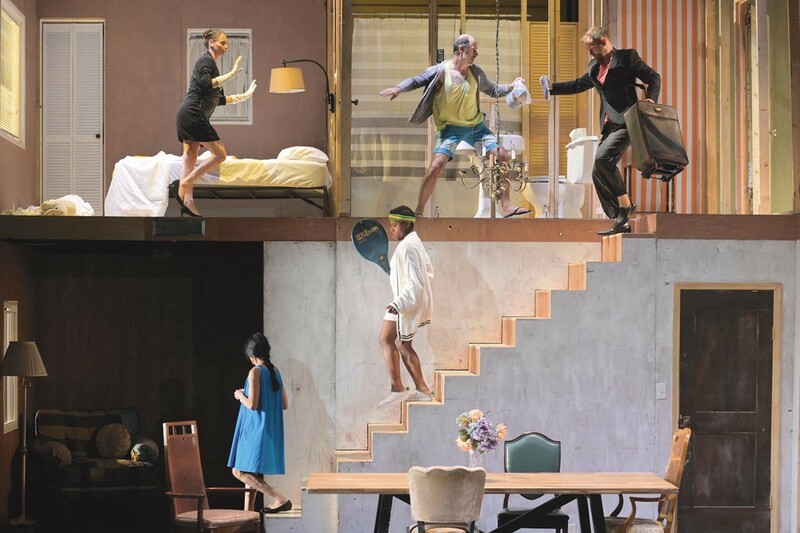 Sophie Bortolussi and Geoff Sobelle (upper level, l to r) with Justin Rose, Jennifer Kidwell, and Ching Valdes-Aran (on the stairs, r to l) in HOME at Berkeley Rep. Although our dwellings are constructed of primarily impermeable materials - bricks, glass, stone, stucco, and treated lumber - our homes remain remarkably porous. During the lifetime of a house, apartment or other living space, stories of multiple generations breathe or echo, and marks or actual items left behind by different occupants create known and unknown crosscurrents. In the basement of a new home, I recall once finding a collection of dusty law journals with mysterious "just so!" markings that suggested the books' owner was preoccupied with justice and protecting civil rights. Irrationally, it pleased me; increased my fondness for the house. It is just this porousness, along with themes related to our sense of place, family and identity, that are the focus of Home, a Berkeley Rep production created by the immensely imaginative theater artist Geoff Sobelle, who brought his unconventional all wear bowlersto Berkeley Rep in 2006. Performed almost entirely without dialogue, designer Steven Dufala's novel scenic concept — a DIY, two-story home interior constructed by the actors and crew during the play's first 25 minutes - is a distinguishing feature. Crisply directed by Lee Sunday Evans, the 105-minute play has Obie-award winning Sobelle and his exuberant, buoyant ensemble accompanied by composer/musician Elvis Perkins, who wanders in and out of the action as a strolling minstrel performing original, folk-style songs. Home is theater, but also a dance, pantomime, magic act, musical performance, contemporary commedia dell'arte, engineering project and ultimately, a mirror or window reflective of universal life experiences. Births and deaths, celebrations and arguments, loneliness and companionship, boring days and profound, one-of-a-kind occasions - all these and more occur in a home. Significant energy and skill is needed to tell a story of architecture that pulses with human frailty, pumps out heroic actions, and illustrates the complete spectrum of forgiveness, resentment, trust, love, anger and other sentiments that its occupants share. As he constructs a wall with simple 2-by-4 beams, plastic sheets, and a staple gun, Sobelle's agile body expresses power, industry, urgency, determination, and humor. His facial expressions and quick glances at the audience break the fourth wall silently, but speak volumes and draw physical and verbal response - applause, quiet cheers. It is the first actor-audience interaction during Home, which eventually springs into full participation when members of the audience are invited onstage. Theater that is "accessible" in this way can be tedious, manipulative, false, or poorly executed, but here, it is delightful and nuanced. The actors are clearly directing people willing to go onstage; how they choose to respond is genuine, fresh and real. Helping an actor to string lights throughout the theater becomes fun, collaborative, teamwork. A moment when two audience members speak about their childhood or present-day homes is striking; their overlapping stories are deeply personal and yet relatable for everyone in the theater. The admirable cast's impeccable movement is pivotal to the production, from frenetic bathroom and party scenes masterfully choreographed by David Neumann, to Illusion Designer Steve Cuiffo's clever bed occupant switch-offs and other magic moments. Balance and sophistication come through potent images; in one example, an elderly man in his final moments on earth stands at a window, bathed in warm light as a dazzling orange lei he wears is gently blown by the wind. For people seeking a summary statement at the end - or to understand Perkins' hard-to-discern lyrics without reading them in the program — Home will have a downside. It's too bad because Perkins, in a song titled "Bivouac," writes (and sings with less articulation than would benefit the show), "With every thought of safe and sound/Your only home is in and out of your body." People not prone to read programs might miss out on the well-written phrase. Without dictating a specific interpretation, it's a fitting, porous conclusion allowing people to absorb and reflect on home in ways both unique and universal.